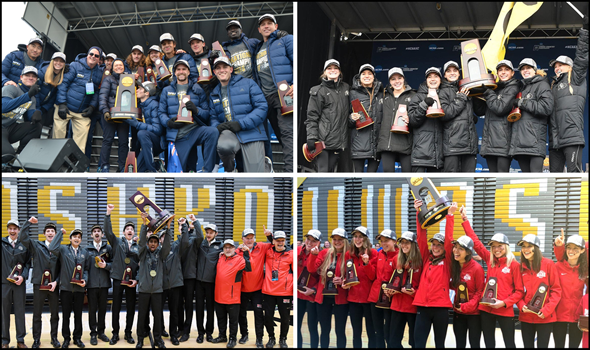 There was an unmistakable beauty in how each of the four teams won national titles yesterday between the two NCAA Championships in the state of Wisconsin. For starters, Northern Arizona cemented its legacy among the greatest teams of all-time, while North Central (Ill.) extended its incredible winning tradition. Both the Lumberjacks and the Cardinals won their third national titles in a row, something that hadn’t been done by an NCAA Division I men’s program since Arkansas from 1998 to 2000, and something that hadn’t been done by an NCAA Division III men’s program since – Well, you guessed it – North Central (Ill.) from 1997 to 1999. NAU and North Central (Ill.) seized their crowns by brute force. There is no easier way to put it. Both the Lumberjacks and the Cardinals rampaged through their respective races and left the rest of the field scrambling in their wake. When all was said and done in Madison and Winneconne, NAU and North Central (Ill.) put their entire scoring lineups in the top-25, according to team scoring positions. The Lumberjacks, led by Tyler Day, saw it runners finish in fifth, 12th, 19th, 22nd and 25th, while the Cardinals, led by individual champion Dhruvil Patel, crossed the finish line first, second, seventh, ninth and 24th. Then you have Colorado, a team that always seems to rise to occasion at the NCAA meet (That was the 12th time in 27 trips to NCAAs that Mark Wetmore’s program earned a spot on the podium). All five of the Buffs’ scoring athletes were impeccably positioned throughout the race. Colorado’s runners went from 17-18-24-39-61 at 2K to 7-11-15-21-27 at 4K to 1-8-14-20-22 at the finish. The low stick belonged to Dani Jones, who won the individual title to cap a remarkable season. The Buffs scored 65 points, the fourth fewest by a winning team since the race distance changed from 5K to 6K in 2001. Guess who owns the third lowest score? That’s right: Colorado in 2004, the last time it won the national title. And what can you say about Washington (Mo.)? A team must run a perfect race to beat Johns Hopkins at the NCAA meet. That’s exactly what the Bears did as they toppled the Blue Jays by one point, 98-99. WashU moved as a massive unit throughout the 6K tract at Lake Breeze Golf Club. The Bears sat in scoring positions 5-14-32-60-104 at 2K and trailed Johns Hopkins by 146 points. That deficit shrank to 113 by the 3K split as WashU’s runners improved to 5-11-26-50-98. The Bears cut that down even further to 16 points with 1K to go as they were 1-8-14-32-62. Then WashU kicked it into high gear and grabbed the national title as its runners crossed in scoring positions 1-6-10-23-58. Here are the respective improvements by each spot: +4, +8, +22, +37, +46. Cross country is the ultimate team sport. Colorado, North Central (Ill.), Northern Arizona and WashU proved that yesterday.